Alabama GOP Senate candidate Roy Moore has been accused of sexual misconduct by several women, including one who says he initiated sexual contact with her when she was 14. Three new accusers have come forward against Alabama GOP Senate nominee Roy Moore, adding to mounting allegations of sexual misconduct against teen girls when Moore was in his 30s. The Washington Post, which broke the initial allegations against Moore last week, reported late Wednesday that Moore approached Gena Richardson when she was a high-schooler working at Sears and asked for her phone number. She declined to give it to him, and he later called her at school to ask her out. She ultimately relented, "feeling both nervous and flattered," the Post reports. Their movie date ended "with Moore driving her to her car in a dark parking lot behind Sears and giving her what she called an unwanted, 'forceful' kiss that left her scared." Richardson's account was corroborated by Kayla McLaughlin, a classmate and co-worker who also said Moore pursued her and other teenage girls who worked at the Gadsden Mall. Phyllis Smith, who worked at a clothing store in the mall when she was 18, told the Post that teenage girls working at the mall told each other to "just make yourself scarce when Roy's in here, he's just here to bother you, don't pay attention to him and he'll go away." AL.com has reported that Moore was known to cruise for young girls at the local mall in his hometown of Gadsden. A man who worked at the mall in the early 1980s told CNN that Moore had been banned from the mall because "he was bothering girls in the mall." Also on Wednesday, AL.com also published new allegations against Moore from Tina Johnson, who said that in 1991, Moore, who was married and an attorney on a child custody transfer case involving Johnson, had come on to her and grabbed her buttocks. She was 28 at the time. "He didn't pinch it; he grabbed it," Johnson said. A second woman, Kelly Harrison Thorp, told AL.com that when she was a 17-year-old waitress in 1983, Moore asked her out and told her, "I go out with girls your age all the time." She turned him down. Just before the allegation from Johnson was reported, Moore's campaign held a news conference to try to discredit another accuser, suggesting that a yearbook inscription he allegedly wrote was fabricated. On Monday, Beverly Young Nelson, represented by famed feminist attorney Gloria Allred, said Moore groped her and tried to force himself on her in his car when she was 16 and he was in his 30s. As evidence that the two knew each other, Nelson presented an affectionate 1977 yearbook message. On Wednesday, speaking outside the Alabama Republican Party headquarters, Moore campaign attorney Phillip Jauregui said he wants the yearbook released by Allred so that an independent handwriting analyst can determine the authenticity of the inscription. "Release the yearbook so we can determine is it genuine or is it a fraud," Jauregui insisted. But even without an independent analysis, the attorney cast doubt on the yearbook message, pointing out that Moore had been the judge assigned to Nelson's past divorce case. He suggested the "D.A." after Moore's name in the yearbook inscription — apparently an abbreviation for "district attorney," when Moore had, in fact, been an assistant district attorney at the time of the assault alleged by Nelson — was how Moore's assistant put her initials on an order in the divorce case roughly two decades later when Moore had become a judge. Allred later told CNN that her client hoped to testify under oath before the Senate about her allegations against Moore. The news conference was the latest attempt by Moore's campaign to stay viable given the mounting accusations against him and increasing loss of support from key figures in the GOP. It focused only on the allegation by Nelson and did not address the other allegations against Moore by other women, including Leigh Corfman, who claims he initiated sexual contact with her when she was 14. On Tuesday evening, Fox News host Sean Hannity — who has frequently championed Moore on his program — said he was giving the former Alabama Supreme Court chief justice "24 hours" to explain inconsistencies in his pushback against allegations from five women that he sexually assaulted them or pursued them romantically when they were teenagers and he was in his 30s. On Hannity's radio show last Friday, Moore gave conflicting answers about whether he knew some of the women who had come forward or whether he dated teenage girls, saying that "not generally, no," he did not date girls that young and that "I don't remember dating any girl without the permission of her mother." The comments by Moore's lawyer on Wednesday appeared to be a response to Hannity's ultimatum. And hours after the news conference, Moore's campaign released a letter it had sent to Hannity reiterating much of what his attorney had said at the news conference. 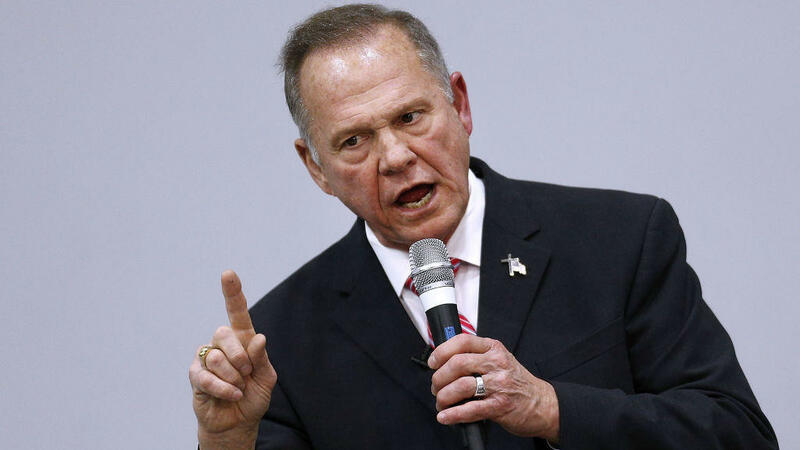 "I adamantly deny the allegations of Leigh Corfman and Beverly Nelson, did not date underage girls, and have taken steps to begin a civil action for defamation," Moore wrote. "Because of that, at the direction of counsel, I cannot comment further." On his show Wednesday night, Hannity overall seemed satisfied that Moore had responded to his concerns, but he said that it was up to the voters of Alabama to be the final arbiter. "I am very confident that when everything comes out they will make the best decision for their state," Hannity said. The Alabama Republican Party is also standing behind Moore. NBC News reported Wednesday evening the state GOP did not vote on whether to withdraw its support for Moore as the party nominee. If the committee had pulled support, Moore's name would have remained on the ballot, but if he won, the election would have been deemed null and void and a new special election would have been ordered. The Republican National Committee severed a fundraising agreement with Moore's campaign on Tuesday night, and Politico reported the RNC has also canceled a field program on behalf of the GOP nominee ahead of the Dec. 12 special election, where Moore faces Democrat Doug Jones. Alabama's senior senator, Republican Richard Shelby, told reporters on Capitol Hill that he won't vote for Moore and would write in a name, calling Sessions an "ideal candidate." President Trump, who backed Strange in the primary, ignored questions from reporters about Moore after giving a statement on his recent trip to Asia on Wednesday. Asked Saturday while in Vietnam about the allegations against Moore, Trump said he hadn't paid much attention to the news and "have to look at it and I'd have to see." White House press secretary Sarah Sanders said last week that the president "believes that if these allegations are true, Judge Moore will do the right thing and step aside." A new poll conducted by the National Republican Senatorial Committee shows that Moore now trails Jones by 12 points — reflecting a 12-point drop in support for Moore since before the scandal broke. Moore's favorability has also cratered, with just 35 percent of likely voters surveyed holding a favorable opinion of the GOP nominee and 52 percent having an unfavorable opinion. The NRSC has already pulled financial support from Moore. Politico first reported on the poll, and NPR obtained the survey from a GOP source. That poll gives a more generous lead to Jones than other recent surveys have as the scandal has unfolded; some still show Moore with a lead. Moore's campaign has continued to hit back at the allegations that were first reported in The Washington Post last week, painting his candidacy as a battle against the Washington, D.C., establishment that has turned against him. And on Tuesday in an interview with MSNBC, his attorney Trenton Garmon addressed the allegations — which Moore has given conflicting answers about — that he did date teenage girls and got permission from their mothers to do so. "In other countries, there's arrangement through parents for what we would refer to as consensual marriage," Garmon said, after referencing MSNBC anchor Ali Velshi's "diverse background" and implying he might understand that. "What does Ali's background have to do with dating a 14-year-old?" MSNBC co-host Stephanie Ruhle retorted, defending Velshi, who was born in Kenya but raised in Canada. There have also been reports of robocalls from someone named "Bernie Bernstein" purporting to be a Washington Post reporter seeking damaging information on Moore in exchange for thousands of dollars. There is no Post reporter by that name.